Abstract: Objective To assess the effect of des-acyl ghrelin (DAG) on the proliferation of ovarian epithelial carcinoma cells and the related mechanism. Methods SKOV3 ovarian epithelial carcinoma cells were cultured and treated with DAG, with or without mammalian target of rapamycin (mTOR) and Wnt signaling pathway activator. Cell proliferation was measured by the CCK-8 assay. Results DAG inhibited the proliferation and growth of SKOV3 cells in a dose-dependent manner. 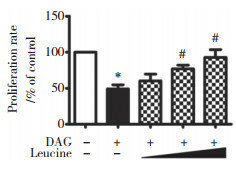 DAG exposure induced the inhibition of the mTOR and Wnt signaling pathways. 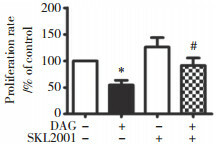 Activation of these two pathways blocked the inhibition of SKOV3 cell proliferation by DAG. Conclusion DAG inhibits the proliferation of SKOV3 ovarian epithelial carcinoma cells through the mTOR and Wnt signaling pathways, and may contribute to prevention and therapy of ovarian epithelial carcinoma.